Recently in the Maritimes, there were two separate incidents of Syrian families losing their homes to fires. One fire led to the tragic death of seven children. In both instances, the communities they lived in rallied around them and got them back on their feet as far as their material needs went. There are also happier stories of Syrian families making a new life in Canada, starting businesses and so on. In the months and years to come, perhaps we will be reading stories by next-generation Syrian families of their experiences in a totally new place. In Alison DeLory’s Making it Home, published by Vagrant Press,* we have a novel involving a Syrian family coming to Canada. The author dovetails a Syrian family escaping Aleppo to live in a refugee camp in Turkey, with that of a family in Falkirk Cove, a small community on Cape Breton Island. A pod of whales beaching themselves in August 2014 leads off the novel and serves to introduce us to the main Falkirk Cove characters that unite to rescue them: Tinker, Bob, Charlie, Nell, and Catriona. Later on, we’ll meet Tinker’s wife Florence. Two other secondary characters we will soon encounter are Jean, who owns the Kwikmart (the only store in the village) and Roger, a calendrical savant who roams freely throughout the town (and the story). Meanwhile, a world away in Aleppo, Amira and Sami’s apartment and it’s surrounding neighbourhood is starting to feel the effects of the civil war. The only thing delaying their departure is Sami’s occupation as a medical doctor. He feels a responsibility to his fellow citizens to remain. One day, Sami’s office building is the casualty of a bomb and they realize now is the time to go. They along with their children Ahmed and Yasmine manage to flee with very little across the border to Turkey and the refugee camp at Reyhanli. Back in Falkirk Cove, the conflict is that of Charlie, Tinker and Flo’s grandson, leaving the Cove for work in Alberta. This is particularly troublesome for Tinker, for his son Russell (Charlie’s father) lost his life there in an explosion five years earlier. Tinker staunchly believes nothing good can ever come of leaving home to work out there (he is eventually proved right). Charlie is also leaving behind his girlfriend Nell, who has just come back to the Cove after finishing university. Charlie is keeping a secret from Nell and his grandparents and feels that going West will help him escape it (it doesn’t). Thrown into all this is the revelation Russell had fathered a child with another woman shortly before he died, giving Charlie a half-brother (Alex) and Tinker and Flo another grandchild. However, Alex’s slatternly mother Courtney has an ulterior motive for getting in touch with Alex’s Nova Scotian grandparents. All this, along with Charlie’s brief sojourn west, make up the bulk of the novel. Meanwhile, our Syrian family are living in a tent in the refugee village, awaiting a time when they might be allowed to leave to live elsewhere. They know they can never go back to Syria any time soon. While I definitely found Making it Home interesting to read, there were several times when you just knew what was going to happen and were simply reading to prove yourself right. As for the characters, Flo is the embodiment of hard-working, long-suffering womankind who can cook up a storm, keep a spotless house, raise a five-year-old grandchild and organize a Syrian Refugee Project, while her husband Tinker dozes in his La-Z Boy. Tinker is the sole holdout on the Syrian Project, spouting the usual objections: “Resettlement’s the government’s job” “There’s no jobs here for locals and we want to bring in foreigners?” “These people could be dangerous — terrorists even. We don’t know. They’re not like us.” The small community is resolute, however, and the money-raising begins in earnest, and there’s an exciting round of “Chase the Ace” to be had that gets national attention. 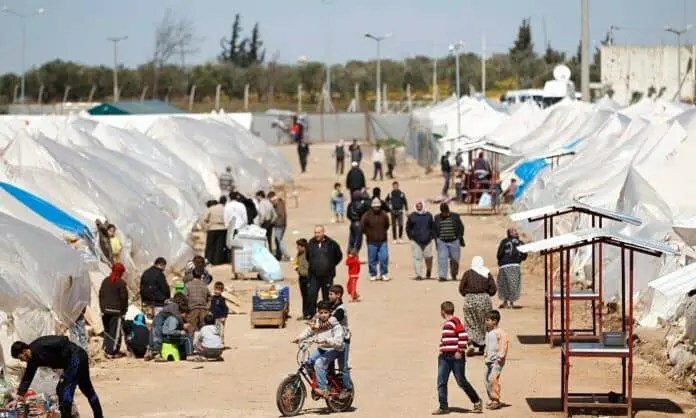 The Syrians, whose plight interested me far more than the goings-on in Falkirk Cove and Alberta, are portrayed well by the author, who credits a Syrian friend that read through her manuscript and performed a “sensitivity edit.” Their life in the refugee camp is well-written, too. The claustrophobia of so many in a tent, no privacy, and very little space between neighbours cannot be easy to endure for any amount of time, let alone years. In short, Making it Home is well worth a read. It is when the story reaches out beyond the reclusive community of Falkirk Cove that makes for the best reading. Both families want to stay in their respective homes, but economics and civil war forced them to make difficult choices about where they will eventually “make it home.” Consider adding Making it Home to your summer reading list. *This review is based on an Advance Reading Copy provided by the publisher. Making it Home is slated for release in June 2019. You may pre-order it at Amazon.ca using the links below. Please note if you choose to purchase this book through Amazon using the link below I will receive a small commission at no extra cost to you. If you cannot see the Amazon ad below (if you are using an ad blocker, for instance) here is the link: https://amzn.to/2UQo8Gthttps://amzn.to/2UQo8Gt Thanks! It sounds like there’s a lot going on in this book. But in a good way! Looking forward to it!